František “Ringo” Čech (1943) is not only a “bigbít” veteran and a living legend, he is also one of the most controversial figures in Czech rock history. On one hand his music taste has never been really refined, on the other he supposedly didn’t only make friends among his colleagues during his career, neither with his business practices nor with his public statements. Čech originates from a family of musicians, his father was a well known songwriter in Prague. His career began as a teenage drummer in dixieland and brass orchestras. In that context it’s worth to mention that he’s probably the first (future) Czechoslovak rock musician ever to appear on a 12 inch long player: as a member of the Study Group Of Traditional Jazz he hit the skins on a track from the Czechoslovak Jazz 1963 compilation, sharing the vinyl grooves with top jazz names like Karel Krautgartner, Gustav Brom, Luděk Hulan or Karel Velebný. In 1963 Čech began to study at the Prague Conservatory, but at the same time he decided to become a rock’n’roll drummer. He got a job at the Olympik club, Prague’s beat address number one. With the club house band, the original Olympic, he recorded about two dozens of 7″ sides until 1965, including Dej mi víc své lásky (Give Me More Of Your Love), their first self-penned beat hit in Czech language. He quitted for a prestigious Las Vegas engagement with Jiří Srnec’s Black Theatre while J. A. Pacák became Olympic’s new drummer. Back from the States, Čech tried his luck with rock’n’roll again, founding the all-star Rogers Band with several former rock’n’roll stars, but by 1967 pure rock’n’roll was already out of fashion. The history of the F.R. Čech Group begins in 1968 in the renown Semafor Theatre in Prague. They used to work there as the Shut Up Orchestra, being one of the theater’s house bands and usually backing comedy shows by Šimek & Grossmann. Initially their repertoire mostly consisted of country & western covers with Jiří Grossmann’s and later with Čech’s lyrics – sometimes humorous, sometimes rather silly. Shut Up performed and recorded with Grossmann, Jiří Helekal, Pavel Bobek, Miluše Voborníková, Karel Černoch or the ex-Rebels (what a pun…!) Jiří Korn. Among the group instrumentalists were Čech’s brother Svatopluk on bass, former Komety guitarists Kaleš and Reiner, keyboarder Zdeněk Merta or the ex-Juventus Petr Rezek. Čech was still sitting behind the drums but he also slowly evolved to the group’s master mind. After Grossmann’s death in 1971 Shut Up began to work with singer Viktor Sodoma who was still trying to launch a pop career since the 1968 breakup of the Matadors. At the very least, at that time Čech proved a good sense for choosing obscure bubble-gum music cover versions which then became popular hits in Czechoslovakia. The only part that might have been close to subversion and therefore objected by the authorities was the English band name, thus Shut Up had to be relabeled as F.R. Čech Group. In 1973 Čech retired from playing the drum kit and became what we would call an M.C. these days – a master of ceremony – while he was still occasionally standing behind assorted percussion instruments on stage. Although he never really left the pop genre for the years to come, as an opportunist that he was he must have realized that the continuing communist oppression on rock music in the early 1970s could actually help him on his way to even bigger fame while gaining credibility by the non-commercially oriented young audience. So in times when almost everyone else in Czechoslovakia would be giving up distorted guitars in favor of safe jobs on the legal side of pop music, Čech’s group began to fire up their boosters in an unheard manner to date, bringing examples of contemporary hard rock à la Deep Purple or Black Sabbath to the hungry freaks. And with that change in style a definite change behind the lead vocalist’s microphone became inevitable as well, but that’s already another story. Bafff is a “cover” of Babatunde Olatunji‘s ultimate afro groove Jingo, a.k.a. Jin-Go-Lo-Ba. But F.R. 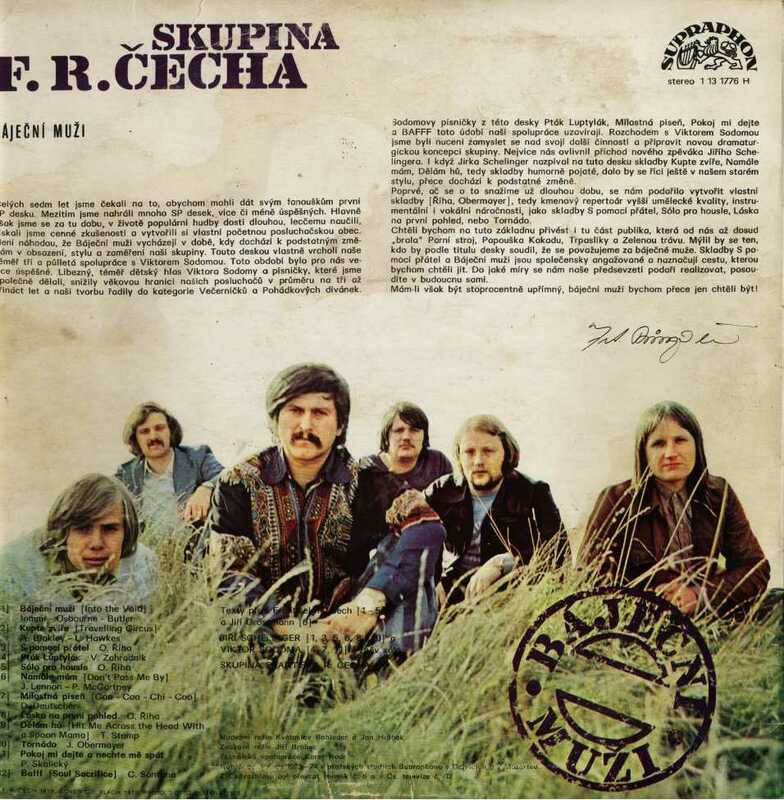 Čech was covering Santana’s latinized version from 1969 and he even got it all wrong because he obviously believed he was playing a track called Soul Sacrifice, at least that’s what the album cover says. (It’s likely that Čech & Co. only had a taped copy of a Santana LP and thus they weren’t able to figure out the corresponding track titles…) The song has been recorded by the Czech TV in 1973 or 1974, in the transition period before Sodoma’s definitive departure and while the new vocalist Jiří Schelinger arrived. The exact line-up or the recording date seems unknown though. František Ringo Čech was playing percussion, of course, and he’s not even doing all that bad. Most likely there’s the future Katapult frontman Oldřich Říha playing lead guitar and the Shut Up veteran Miloš Nop (1949-2006) was on organ. Jindřich Vobořil might have played bass and either Anatolij Kohout, Petr Eichler or Jiří Jirásek (ex-George & Beatovens) was drumming. Whether Sodoma or Schelinger were singing any backing vocals is unsure as well. For sure is that Bafff isn’t the ultimate Jingo rendition, that honor belongs without doubt to Candido’s disco monster from 1979. But it’s still a remarkable afro-rock/latin-rock effort for a pop band that’s been stuck behind the Iron Curtain through the best era of the rock history. And as I have stated a couple of weeks ago, it’s one of the very few examples of this genre ever recorded in Czechoslovakia in the seventies. Unfortunately, as a quasi-instrumental cover tune it seems to be omitted from any Schelinger/Sodoma/Čech CD compilations, so grab it while it’s hot. Stay tuned to this channel, more about Schelinger/Čech & Co. will surely show up here in the future. Yes it is! Probably maximum for me.